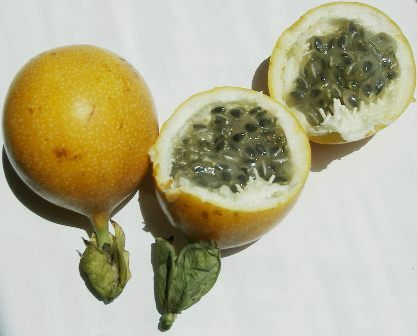 Other names: Sweet granadilla, sugar fruit. Granadia is a native of Andes mounrtain of Central America and grows there beween Bolivia, Venzuela and Columbia extending southwards upto Northern Argentina. Towards North, it grows upto Mexica. 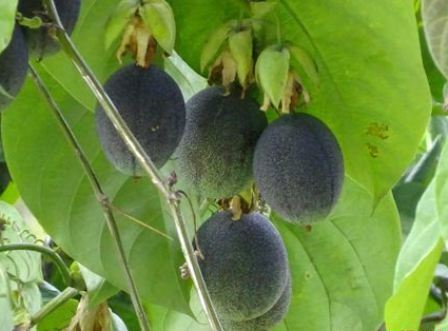 But now this fruit has reached other regions to and can be seen in Africa, Australia and South East Asia too where they call it “sugar fruit”. Granadia grows wild and is cultivated too. As it is a quite nutritious fruit, so it is in demand Europe as well as America and can be seen being sold in super markets there. 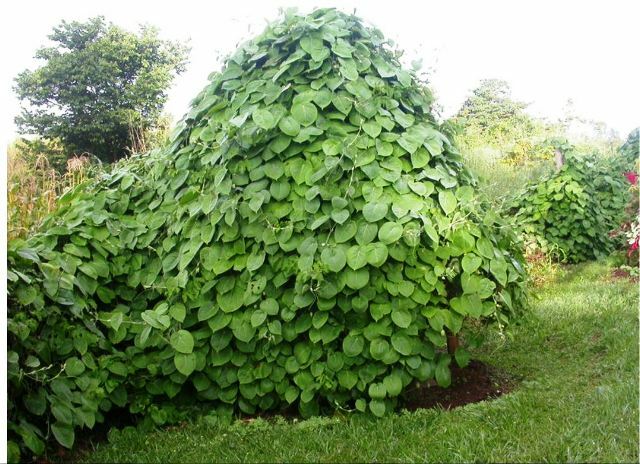 A vigorous , strong growing vine, woody at the base, climbing by tendrils, topping the highest trees, shading out and killing the understory. 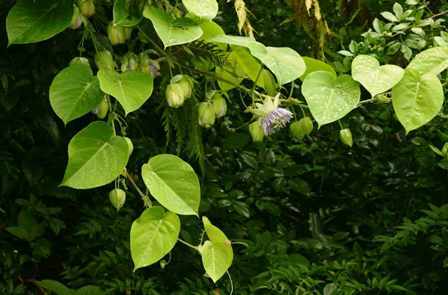 Leaves broadly heart-shaped, pointed at the apex, 8-20 cm long, 6-15 cm wide, conspicuously veined, medium-green on the upper surface, pale-green with a bloom on the underside; spaced along the petiole, are 3 pairs of hair like glands about 1 cm long; at the leaf axils, there are paired, leaf like stipules, ovate-oblong and about 2.5 cm long and a little 1.25 cm wide; more or less finely toothed. 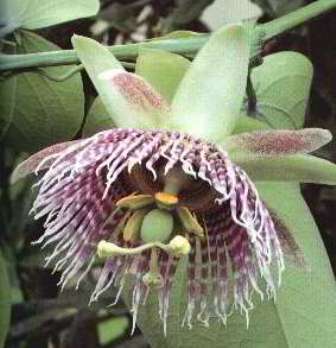 Flowers, sweet and musky in odor, usually 2 to a node, may be 10 cm across, on 4 cm peduncle bearing 3 leaf like, ovate-oblong, pointed bracts, 4 cm long and 1 in 2.5 cm wide, faintly toothed; sepals greenish-white, lanceolate; petals pinkish white; the filaments, in 2 rows, white, horizontally striped with purple-blue. Fruit is broad-elliptic, 6-7.5 cm long, green with purple blush on sunny side and minutely dotted when unripe, orange-yellow with white specks when ripe; rind smooth, thin, hard and brittle externally, white and soft on the inside. ; pulp (arils) whitish-yellow or more or less orange, mucilaginous, very juicy, of sprightly, aromatic flavor. Seeds numerous, black, flat, pitted, crisp but fairly tender. The fruits are edible. For eating fresh out of hand in the field, these are cracked and the pulp is sucked into mouth. However, if fruits are to eaten on table, these are cut and the pulp is taken out with a spoon. Besides eating fresh, granadia juice is also consumed. For juice, the pulp is strained to remove the seeds. 100 g of pulp and juice combined together contain, moisture, 70-80 g; protein, 340-470 mg; fat, 1.50-3.18 g; crude fibre, 3.2-5.6 g; ash, 0.87-1.36 g; calcium, 5.6-13.7 mg; phosphorus, 44.0-78.0 mg; iron, 0.58-1.56 mg; carotene, 0.00-0.035 mg; thiamene, 0.00-0.002 mg; riboflavin, 0.063-0.125 mg; niacin, 1.42-1.81 mg; ascorbic acid, 10.8-28.1 mg..
Granadia has a preference for subtropical climate. It does not seem to like heat. It can do well in all type of soils. New planyts can be raised from seed as well as from cuttings.